USA Renovations has provided Sealed Concrete services not only in the DFW metroplex but also the 48 states. With integrity + results being the focus of the service we provide, we won’t settle for quality other than the best. We manage several crews which allow us to fit your needs, your schedule and your demand. Whether you are a general contractor or direct buyer, we want to work with you and provide the best Sealed Concrete service possible. For a transparently exposed concrete finish that needs a protective barrier at the surface, sealed concrete is an excellent and economical choice. Sealed concrete is designed to repel spills while keeping the surface of the concrete looking top notch. 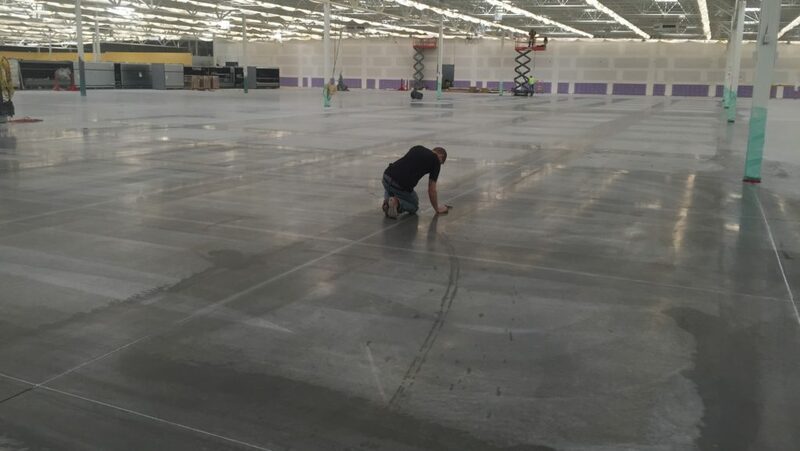 Sealed concrete has been a top pick for large warehouses, cross-docks, and commercial settings. It is important to know there are penetrating and topical sealers available today. Knowing the difference is key. the surface the finish will resist the liquid. As for topical sealers, these products are designed to repel liquids entirely. It is important to consult with our professionals to determine which is best for your applications. No Dusting – Leaving your concrete slab unprotected allows the surface to dust. 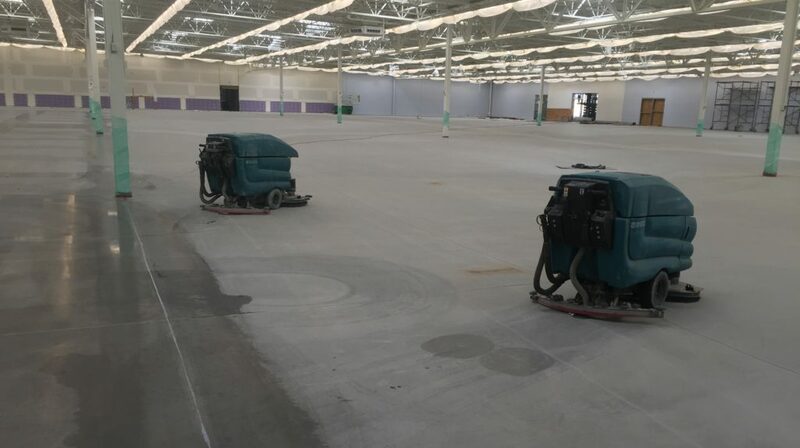 This takes place with foot traffic, forklifts, any time of surface wear will release small particles of the untreated surface that is classified as concrete dusting. Regardless of the sealer you chose, penetrating / topical, all eliminate concrete dusting. Budget Friendly – Sealed Concrete is by far the most inexpensive finish that will protect your slab from the elements while keeping the great look of an exposed concrete slab. Topical Sealers – bond to the surface of the concrete forming a barrier between the concrete slab and the elements protecting the surface from oils, liquids, chemicals, salts, and many other penetrating fluids from penetrating the slab through pores at the surface. Topical sealers are better known as epoxy, acrylic, and urethane top coats. 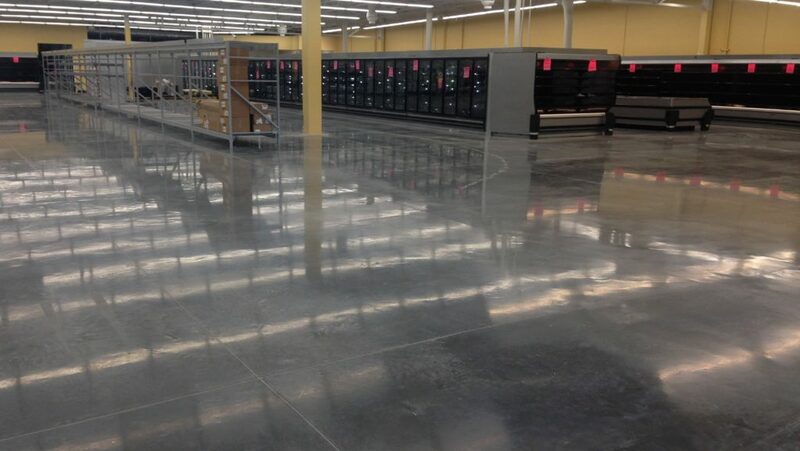 Although Topical Sealers are best at protecting the concrete from the elements the costs are much greater than a polished concrete floor or densified finish. In addition, as with all topical finishes, this will need to be monitored long term as reapplication may be necessary. Penetrating Sealers – include a reactive chemical that modifies the surface of the concrete. The application of a Densifier ultimately impregnates the surface of the concrete strengthening the surface PSI while allowing it to remain a breathable finish. This Penetrating Sealer, or better known as a Densifier, is available in several different forms with the most popular being a Sodium, Lithium, or Potassium Silicate. This higher PSI reduces the chances of concrete dusting and surface scratches. For a higher scratch resistant floor along with several other advantaged please CLICK HERE to view our Polished Concrete page. HOW IS SEALED CONCRETE INSTALLED? We recommend the use of auto scrubbers with a cleaning agent that will assist the auto scrubbers in removing dirt and grime from the surface. Freshly placed concrete may require the use of a cure removal product to assist in removing the cure remnants after a slab has been finished. Upon completion of the prep, we complete a site was of the area to ensure all areas of the slab have been thoroughly cleaned and prepared. Next is our application stage. There are two methods to installing a sealed concrete floor. With penetrating sealers, we use a specialty microfiber pad and application spray gun to apply and work the product in. With topical sealers, we apply with specified rollers to evenly apply the sealer. Upon completion of the sealer, we then kick over to our cleaning procedures. This is our final chance to correct and difficulties that may have occurred during application. Upon final walk we utilize auto scrubbers to thoroughly clean the surface to completion. increasing the strength of the surface. With a stronger slab surface and less porosity, the concrete is now able to withstand additional wear and tear. Additionally, liquid penetration is reduced but the slab will still remain porous. As a single component and entering into the topical sealing category, these acrylic sealers form a protective film over the concrete surface protecting the concrete from moisture penetration. The film is clear and cures without the appearance of a sheen. Still budget friendly these sealers are designed for light foot traffic. We do not recommend acrylics in high traffic areas. As a two-part component polyurethanes begin to step into the epoxy category. This product is a resin with a hardener and a catalyst that when blended react forming a hard topical surface that protects the concrete from continuous exposure to oils, liquids, and other fluids that may penetrate into the slabs pours. These thin mil polyurethane coatings generally are twice the thickness of acrylics allowing for additional protection and longevity. This product is becoming increasingly popular as an alternative to polished concrete with a clear polyurethane top coat over ground concrete. By installing over a refined surface you can achieve the look of an exposed shiny surface with the inherent benefits of a truly sealed floor. GET YOUR CONCRETE SEALED TODAY! What are you waiting for? Now that you understand our process a little better and the benefits have been outlined, let’s talk about your space! If you have any additional questions about the Sealed Concrete process itself or would like a FREE quote on your floors, contact us today by calling 972-984-4673 or email us at john.clark@usarenovations.com.